From New York Times and USA Today bestselling author, Dr Daniel Crosby, comes the behavioral finance book all investors have been waiting for. 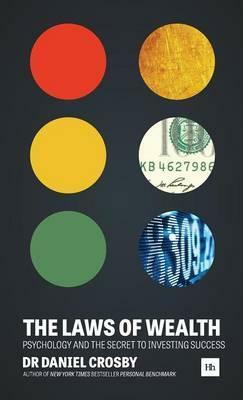 In The Laws of Wealth, psychologist and behavioral finance expert Daniel Crosby offers an accessible and applied take on a discipline that has long tended toward theory at the expense of the practical. Readers are treated to real, actionable guidance as the promise of behavioral finance is realised and practical applications for everyday investors are delivered. Crosby presents a framework of timeless principles for managing your behavior and your investing process. He begins by outlining ten rules that are the hallmarks of good investor behavior, including 'Forecasting is for Weathermen' and 'If You're Excited, It's Probably a Bad Idea'. He then goes on to introduce a unique new taxonomy of behavioral investment risk that will enable investors and academics alike to understand behavioral risk in a newly coherent and complete way.From here, attention turns to the four ways in which behavioral risk can be combatted and the five equity selection methods investors should harness to take advantage of behaviorally-induced opportunities in the stock market. Throughout, readers are treated to anecdotes, research and graphics that illustrate the lessons in memorable ways. And in highly valuable 'What now?' summaries at the end of each chapter, Crosby provides clear, concise direction on what investors should think, ask and do to benefit from the behavioral research. Dr. Crosby's training as a clinical psychologist and work as an asset manager provide a unique vantage and result in a book that breaks new ground in behavioral finance. You need to follow the laws of wealth to manage your behavior and improve your investing process! Educated at Brigham Young and Emory Universities, Dr. Daniel Crosby is a psychologist, behavioral finance expert and asset manager who applies his study of market psychology to everything from financial product design to security selection. He is co-author of the New York Times bestseller Personal Benchmark: Integrating Behavioral Finance and Investment Management and founder of Nocturne Capital. He is at the forefront of behavioralising finance. His ideas have appeared in the Huffington Post and Risk Management Magazine, as well as his monthly columns for WealthManagement.com and Investment News. Daniel was named one of the "12 Thinkers to Watch" by Monster.com, a "Financial Blogger You Should Be Reading" by AARP and in the "Top 40 Under 40" by Investment News. When he is not consulting around market psychology, Daniel enjoys independent films, fanatically following St. Louis Cardinals baseball, and spending time with his wife and three children.